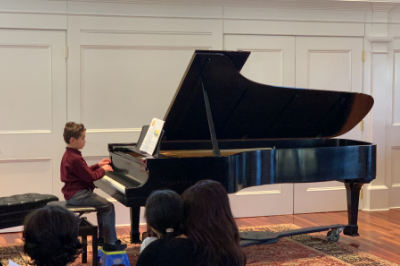 There were both nerves and excitement among The Rivers School Conservatory’s youngest students at their recital on January 26. It’s one of two recitals they will have during the year. The students, ages 5-7, are part of RSC’s Music Box program designed for very young children. Deborah Yardley Beers is the Coordinator of the Music Box Program, which offers individual lessons in violin, cello and piano. “We want kids to fall in love with music, while learning good habits,” she says. “It’s fun and satisfying to learn an instrument, while building other skills they can use for the rest of their lives.” Beers believes music lessons are important at a time when digital media limits many children’s finger skills to those used to swipe or click on a touch screen. Another important part of the Music Box program are weekly group lessons. 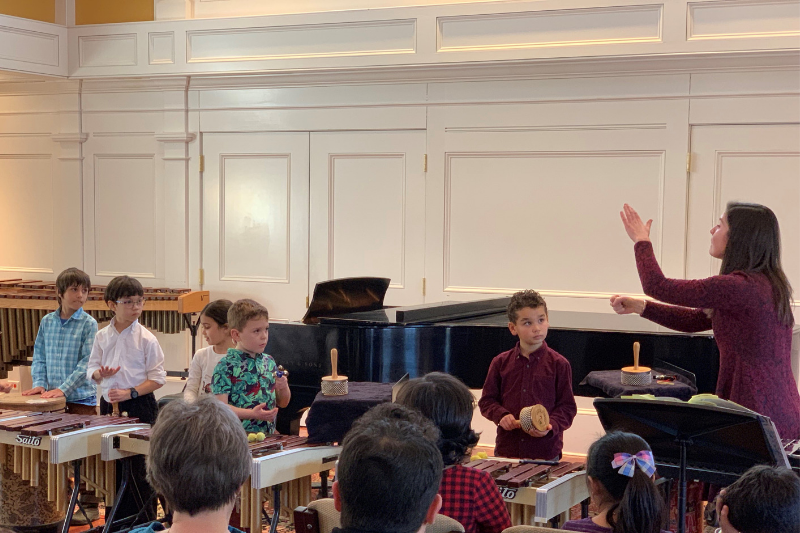 They are derived from Marimba Magic, an hour long weekly class offered at The Rivers School Conservatory, which focuses on developing musicianship through playing marimba and drums, singing, movement, ensemble and improvisation. Music Box has incorporated the half hour marimba class to provide some of the Marimba Magic experience. Alison Hannah, the Music Box marimba teacher, began her music education in Marimba Magic. Beers believes playing marimba in group lessons is a great way for students that age to learn some of the basics of music theory in a fun and engaging way, while also increasing their teamwork and discipline skills. Haverty says at the recital the marimba class played a piece that was inspired by the book Snow that Hannah read them in class. Each student got the chance to share how they interpreted a type of snow from the book. Music has always been a part of Haverty’s life. A pianist and singer as well as the daughter of a musician, she is glad both of her children, 9-year-old Joey and 7-year-old Wils participated in the Music Box program. “Music is a great avenue of expression for children, especially if you expose them to it at an early age,” she says. 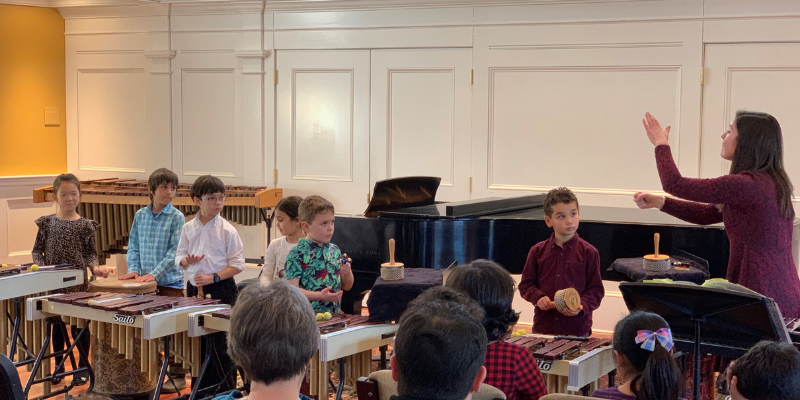 Wils takes piano lessons through Music Box and is an enthusiastic participant in his group marimba lessons, which were not available when Joey was his age. “The marimba teacher Alison is wonderful. She engages the kids. Wils is always eager to learn a new song, so he’s definitely learning on top of having a blast.” She gave one example where Hannah had the children step to the beat and talk about how that beat made them feel. “They are developing their ear for music and how to use it to tell a story.” Joey has graduated from Music Box,but continues to take piano lessons with his same teacher at RSC. Beers says the recital is important for the personal growth of the students. “Performing gives them the good experience of getting up in front of people and doing something,” she says. Haverty agrees about the importance of performing at an age when children may not be as self-conscious. “It’s good to start young. They just want to get up and show off and play their piece,” she laughs. Beers says having the students perform on marimba at the recital as a group in addition to their individual performances gives the students a chance to support each other as they go through the experience together. Learn more about our Music Box program here.